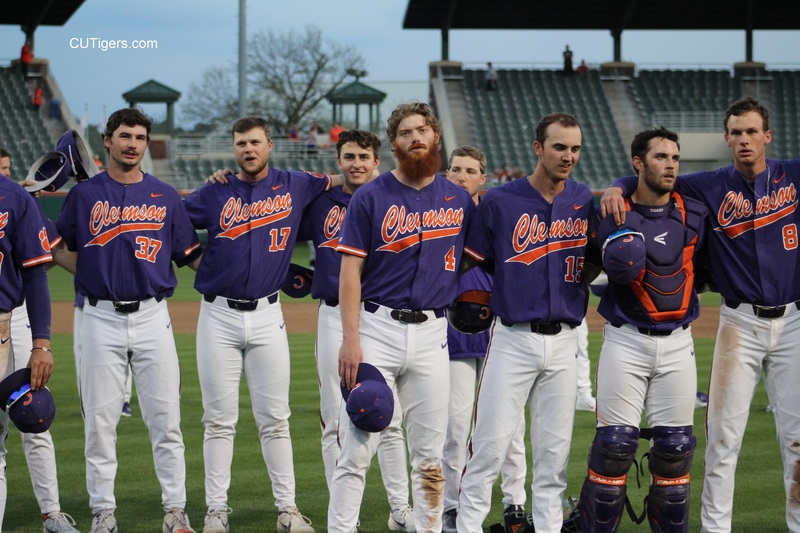 CLEMSON, SC - It was another big day for Byrd, who was 2-4 with a HR and 3 RBI’s as No.13 Clemson beat No.8 Louisville 6-3 to clinch the series in front of 5,640 at Doug Kingsmore. Mat Clark was superb, as he’s been all season, going 7.1 innings and not allowing a run. He improves to 7-0 with a 1.98 ERA after starting the season in the pen! The Tigers are now 2 games ahead of Louisville for 2nd in the ACC and remain one game behind NC State, who survived a scare against BC Friday night. Freshman Bryar Hawkins hit his 3rd HR, giving the Tigers 5 in the series. The Tigers have won 4 of their last 5 versus the Cards and will go for the sweep Sunday at noon. Post-game interviews with Monte Lee, Byrd, Clark and Hall are below!